May is Osteoporosis Awareness and Prevention Month, a good time to evaluate your food choices and exercise lifestyle. 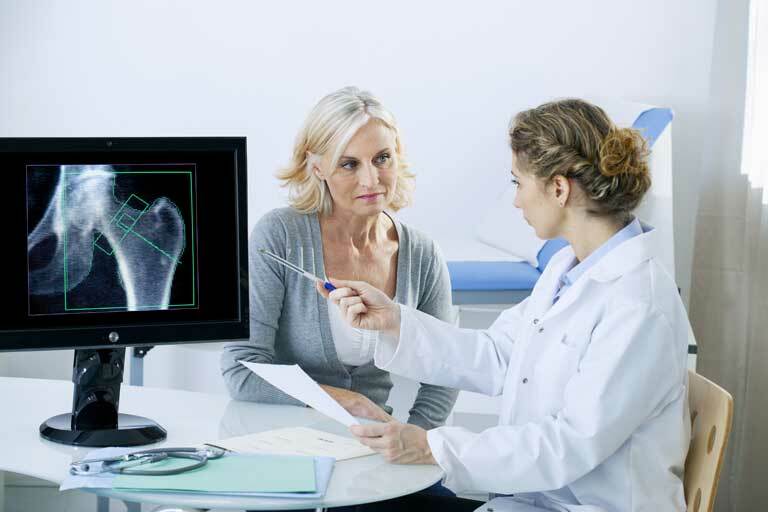 In the United States, osteoporosis affects more than 10 million people over the age of 50. Osteoporosis causes bones to be thin and weak - so weak that a minor fall or a common instance such as bending over or coughing can cause a fracture. Common fractures happen in the hip, wrist or spine. Normally bones are constantly being broken down and replaced. Osteoporosis takes place when the new bone creation cannot keep up with the elimination of the old bone. Bone mass typically declines after the age of 35. Women, commonly after menopause, are more at risk of osteoporosis because they have less bone mass than men do. Healthy eating habits and regular exercise are important for keeping your bones healthy for life. Be lean, mean and eat your protein! Protein is one of the building blocks of bone strength. The power of protein is vital for activating bone rebuilding. The food you eat can affect your bones and it is important to eat the right foods to prevent your bones from becoming brittle. Meat and dairy, of course are basic sources of getting high protein, but not everyone can have them. Some people turn to other protein sources, such as soy, nuts, legumes and eggs. You cannot stand without calcium! Exercise not only builds strong muscles, it can also help you build strong bones. When you exercise, it can help you build strong bones and slow bone loss down. Being active will benefit your bones no matter when you begin exercising, but you’ll gain the most out of it if you start exercising regularly when you’re young and consistent with it. Combine strength training exercises with weight-bearing and balance exercises. Strength training helps build up muscles and bones in your arms and upper spine. These exercises can vary from weight lifting to doing crunches on the floor. Weight-bearing exercises impact mainly the bones in your legs, hips and lower spine. These can be exercises such as, walking, jogging or even stair climbing. Balance exercises decrease your chance of falling, especially as you get older. A good example of balance exercise would be tai chi. Osteoporosis can be sneaky and can attack at any time. Get ahead of it now by taking these steps and making sure your body is on the right path. You can plan how to get ahead by asking your physician or a personal trainer. Stay on track with healthy eating habits and regular exercise. You only have one set of bones, so why not take care of them?